it has been a family tradition for generations. Visits with Granny and Grandad over a Sunday roast and maybe tea and chocolate biscuits in the afternoon. The seventh day has long been a day for families to get together, relax and enjoy some time together with the time pressures of the rest of the week. But today the city council is facing calls to rethink its plans for parking charges on a Sunday amid fears of the impact it will have on family life. Parking charges are to be introduced on Sundays in the coming months in an effort to tackle the city’s growing traffic congestion and help reduce soaring air pollution rates. Families have warned, however, that the changes will make it far harder for city centre residents to enjoy their traditional get-togethers with loved ones. An all-day visit by car that currently doesn’t cost anything will soon cost £30 for anyone visiting family in the city centre. Residents are calling for visitor parking permits to be introduced in the city centre – similar to those on offer in outlying areas – to mitigate the change. The News is today backing them and calling for a system to be brought in to make sure families who live in the city centre don’t suffer. The local authority will roll out a long-planned policy to charge motorists to park on city centre streets on Sunday afternoons, after rejecting a proposal by the Conservatives at last month’s budget meeting to scrap the project. The charges will run from 12.30pm until 6.30pm on controlled parking zones 1 to 4, including 1A – as well as main traffic routes outside the city centre, covering part of Queensferry Road and Broughton Street. The council was unable to provide a full list of streets that will be subjected to the Sunday charges. The council intended to roll out the new Sunday charges from April when the new financial year beings, but it is likely to be delayed by months due to legal processes and advertising traffic regulation orders. In order to help city centre residents potentially impacted by the charges, the council is set to extend its shared parking scheme to include city centre areas. Shared parking zones allow both permit holder and pay-and-display parking in the same allocated spaces and are currently in operation in zones S1 to S4 and N1 to N5. The council says the shared parking spaces “increases the likelihood of residents and non-residents alike being able to find parking opportunities close to their intended destination”. Transport and environment convener, Cllr Lesley Macinnes, said: “Plans to introduce Sunday afternoon parking controls in the city centre recognise the changing habits of residents and visitors and were first approved as part of the parking action plan in 2016. “Restrictions such as these help to encourage the turnover of parking spaces, and in turn footfall for businesses, while maintaining accessibility and ease of traffic movement. Last week, business leaders warned that the Sunday parking charges risk “driving customers away” from the city centre. On-street pay and display charges are also set to soar from April. The council is pressing ahead with the price hike despite officers admitting that during this financial year, expected parking revenue is set for a £372,00 shortfall. The council currently offers visitor parking permits, costing £6 for ten passes. But the permits are only available in zones N1 to N5, S1 to S4, priority parking areas and the Dumbiedykes area of zone 7. There are no plans to extend the scheme to the city centre. Conservative transport spokesperson, Cllr Nick Cook, believes that if the council will not halt plans for the Sunday parking charges, “generous” visitor passes should be thought about to help family members continue to visit relatives in the city centre, without having to cough up for parking. He said: “The council’s need to mitigate its Sunday parking regime before it has even been implemented demonstrates the folly of introducing it when Edinburgh has such a substantial number of city centre residents. “Rather then be seen as a careless afterthought, residents’ needs should have been front and centre prior to deciding to introduce Sunday parking controls. On Tuesday, the council’s transport and environment committee will consider the authority’s strategic parking review – with councillors asked to approve detailed designs being drawn up for “parking controls along the A8 corridor”. Debbie Baird and partner Matt Acton currently live in the Capital’s bustling West End with their three-year-old son, Alex. She admitted she was worried that her mum, who visits regularly on a Sunday, might be put off by having to feed the meter if Sunday parking charges are introduced. Communications consultant Debbie supports the introduction of a friends and family pass system, adding she felt it was unfair for those outside the Capital to be charged for driving into the city centre. 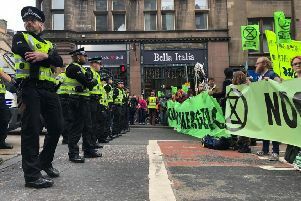 She said: “I can understand why the council are introducing the charges, especially with Edinburgh getting busier and more residential in the city centre, but I do feel that charging people visiting family or friends will put them off coming”. Debbie added: “We have friends from further afield visiting regularly and they have kids as well, coming into Edinburgh from outside the city, it is already an expensive day out, so paying extra on top of that makes it even more expensive.